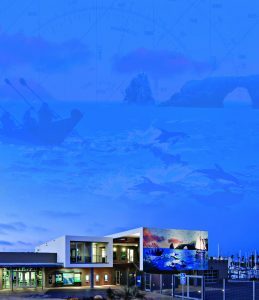 The Channel Islands Boating Center grew out of a strong interest in ensuring that young people in Ventura County have an opportunity to understand the unique resources just off its shores. The concept was to provide access to the beach area near Channel Islands Harbor, access on the water through boating programs and excursions, and opportunities to learn about the offshore ecosystems studied by scientists from around the world. A coalition of partners gathered and worked over a decade to plan a facility designed to provide these opportunities. The lead partner was the County of Ventura, through its Channel Islands Harbor Department, joined by the Channel Islands National Marine Sanctuary, the California Department of Boating and Waterways, and the Channel Islands Harbor Foundation. Funding for the building was provided by these partners, joined by a number of private parties such as the Martin V. & Martha K. Smith Foundation. An exhibit program focused on the Channel Islands was designed and funded by the Channel Islands National Marine Sanctuary. CSU Channel Islands participated in the planning and were designated as the ultimate operator of programs and facility. This idea, born in 1997, was brought to fruition with the opening of Channel Islands Boating Center in 2013. The main focus of the Center is to teach boating skills and to provide outreach regarding the marine environment through school groups, community groups, and the public at large, with educational opportunities and boating-related classes.